The creativity and talent that go into design work are the focus of the current exhibition at the Deasil Art Gallery in Leamington. Art in Design is the title of the exhibition showing works by various artists taking in ceramics, jewellery, wood carving, furniture and lighting, plus mixed media art work. Usha Khosla’s ceramic pieces stand out as art but also vases you could happily use, with earthy and green colours and with an unfinished, natural look to the rims. David Male has used sustainable, local timber from Clifford Chambers to make a limited-edition pepper mill. Claire Murray’s lampshades, one with a delicate pattern of a heron on it, would be a very attractive feature in the home, and Bren Boardman’s mixed media poppy and fritallaria images are also very pleasing. There are also several paintings and mixed media works by Jane Powell. Sarah Turner’s Rainbow Butterflies use the colourful metal of discarded drink cans to make attractive wall displays. 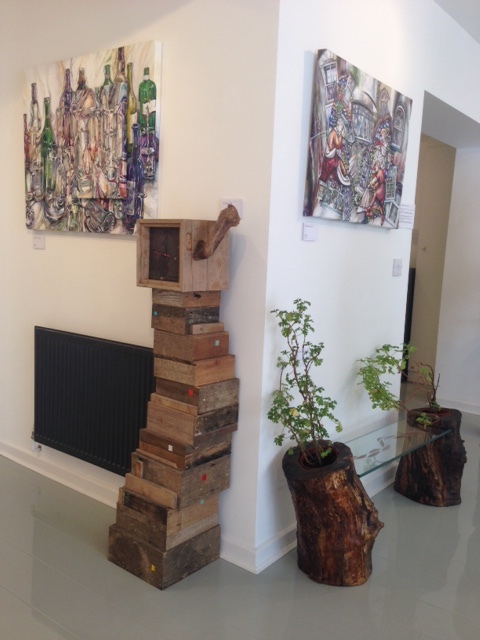 Will Morrison’s clocks, in reclaimed wood on the wall, or a pile of what looks like wooden boxes on the floor, are interesting and statement pieces. 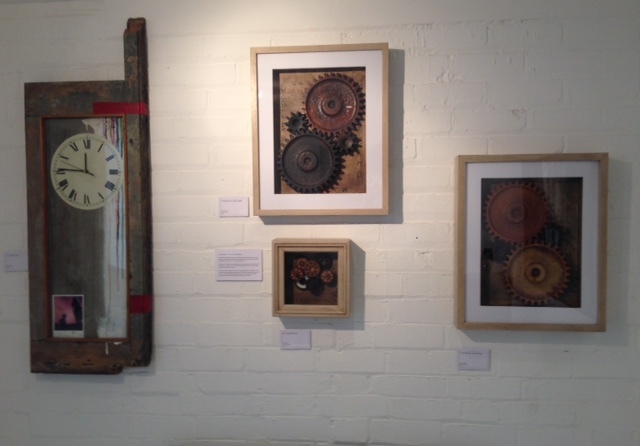 Steve Johnson’s wall-shown works are a mixture of cogs and gears, internal workings brought out of machinery to be the centre of attention (both above). 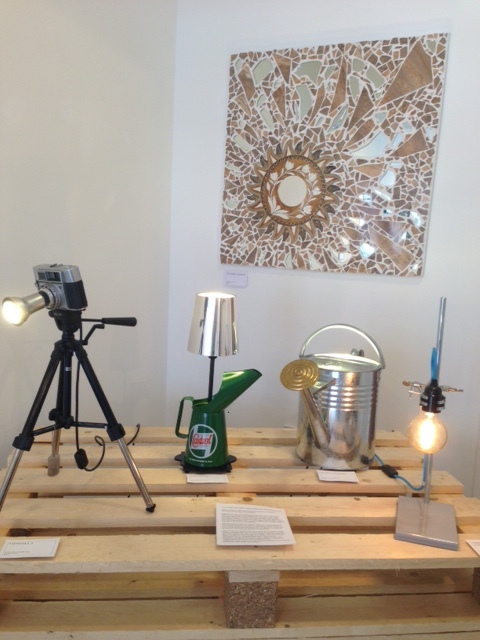 Michael Grassi’s lights illuminate one corner, made from unlikely items including a camera (above). 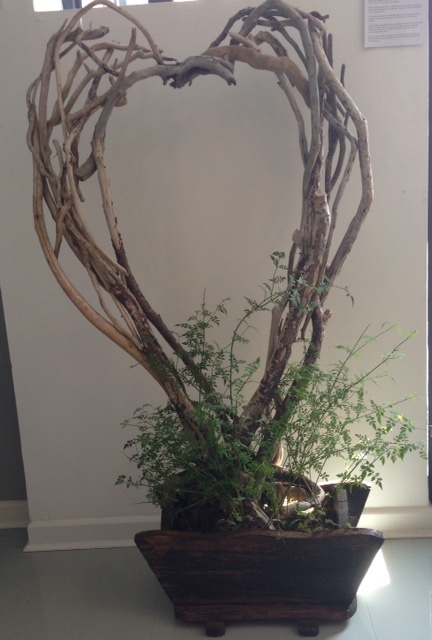 Jason Willis’s driftwood and greenery combinations (below)would look good in a corporate or hotel setting, and Dominic Gubb’s reclaimed leather and furniture leg models of a bulldog and pug dog raised a smile and would make a statement in the right place. It’s another interesting and varied exhibition from the Deasil Gallery which is on show until September 10.